A version of this post originally appeared on GeekDad.com in May 2016. Happy Star Wars Reads Day — With Shakespeare? It’s the Original Star Wars — with a twist! October 5th is “Star Wars Reads Day“. This initiative partners with several publishing companies and involves events throughout the country celebrating Star Wars and literacy. My fellow GeekMom colleague Kay Moore is getting to attend an event at the San Diego Central Library where Ian Doescher’s William Shakespeare’s Star Wars will be read along with a silent viewing of the original (what some of you may call “A New Hope”). That sounds super cool, although I have plans today already. If you aren’t near one of the events, might I recommend stopping by your favorite bookstore and picking up a copy of William Shakespeare’s Star Wars to enjoy. I’m not going to cover the plot of this story. If you’re a fan of my blog, you should know I’m a huge Star Wars fan, especially the originals. The latter three (Episodes I-III) don’t appeal to me quite so much. So I will assume you know the plot of the original Star Wars movie. ‘Nuf said. But what you probably have yet to realize is Doescher’s ability to convert the story into iambic pentameter and illustrate the book with dozens of woodcut-style scenes from the story. It’s magical how he combines old world and modern storytelling. The book is set up like a Shakespeare play, complete with a list of characters, settings, and stage directions. The language pays excellent homage to The Bard’s style, with plenty of “hast”s, “doth”s, and “prithee”s. I read much of Act I aloud to Jacob and Timmy (and our sponsor cadet). I’m afraid their eyes rolled to the back of their heads listening to my overdramatic style of reading, but I was able to introduce a discussion about Shakespeare and iambic pentameter with my boys. I warned them that Shakespeare is coming to an English class near them very very soon and it wouldn’t hurt to study his style with a familiar story. While I don’t have permission to reproduce the text, you can read the first 20 pages through this excerpt at Boing Boing. 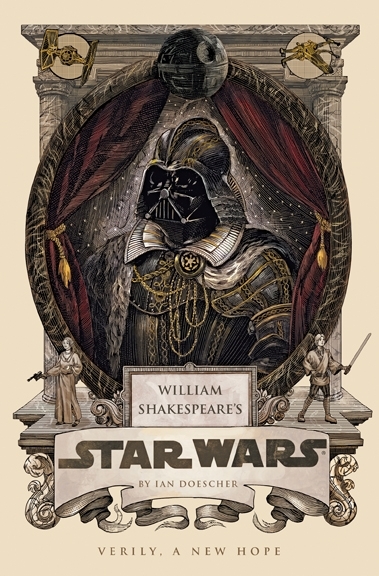 If you get the book, be sure to pay attention to the afterword which explains the special connection between Shakespeare and George Lucas. A fun history. I had a good time reading William Shakespeare’s Star Wars. The book retails for $14.95 and will make a great gift this holiday season. It’s available at most bookstores and through online retailers such as Amazon. Disclosure: A complimentary copy of this book was provided by the publisher. Jacob enjoyed helping me review a book for the blog last month. This post is about Jacob. 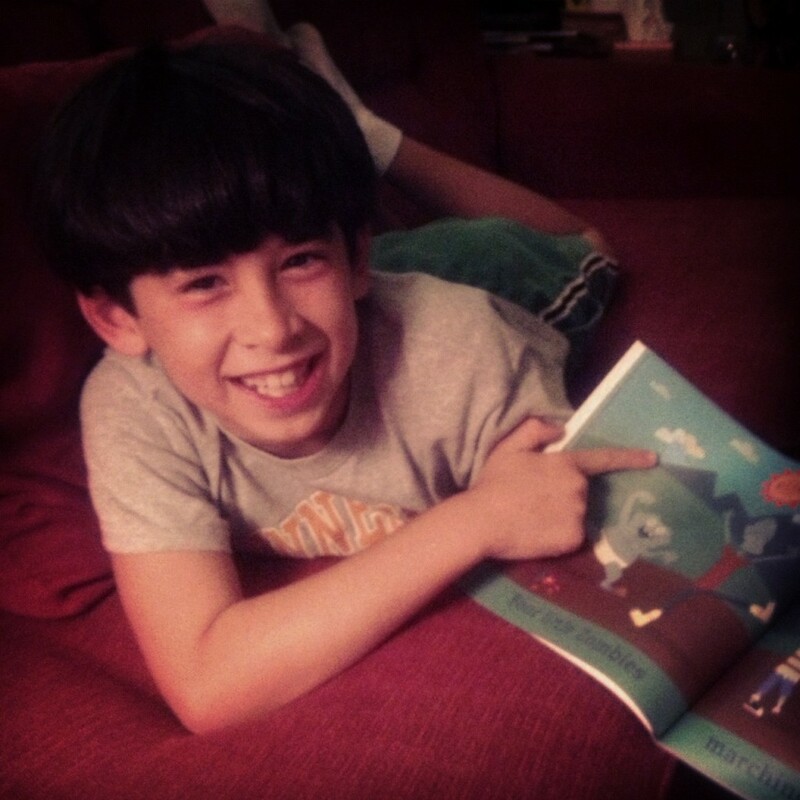 Some folks know — some folks don’t — that Jacob has been our more reluctant reader ever since he learned to read. His little brother plows through books pretty quickly, while Jacob reads more slowly and more deliberately. Jacob had been sticking to book series that are heavier on the illustrations: Diary of a Wimpy Kid, Big Nate, Origami Yoda, Adventures of Tin Tin , etc. Timmy loves those books also, but had no problem reading the Percy Jackson and the Olympians series while in 1st grade. Having Jacob read every day for school had been a challenge. In 3rd grade he had to set reading goals and it was pretty tough working with him to meet those goals. Our attention-to-detail-lover Jacob found Easter Eggs that none of the rest of us did. Here he’s pointing out a cloud “vomiting” rain. In the spirit of Halloween, allow me to present a book review for you! 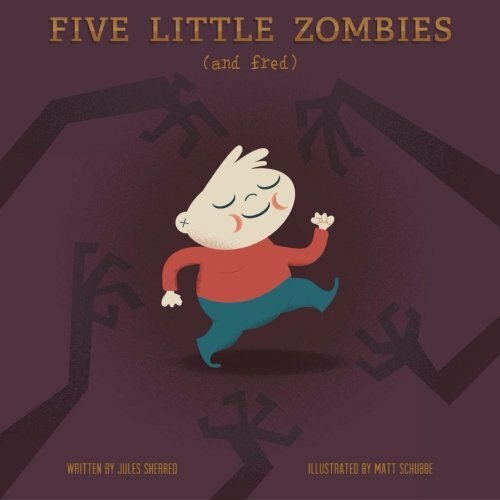 Five Little Zombies (and Fred) is a “children’s book that’s not for children”, written by my friend and GeekMom colleague, Jules Sherred and illustrated by Matt Schubbe. I had the honor of seeing and hearing about Jule’s book idea from its infancy. She told all the GeekMom writers about her IndieGoGo campaign earlier this summer, and contributors to the campaign received sneak-peek MP3s, illustrations and storylines as the assorted funding milestones were reached. The book is a very fun read with plenty of grown-up humor interlaced throughout. It’s the story of Fred being chased by five zombies (as you probably assumed). The dialogue flows very similarly to the familiar “Five Little Monkeys Jumping on the Bed” song/rhyme. Fred’s able to kill most of the zombies, no thanks to the Canadian Mountie he keeps asking for assistance. But if you want the whole story, you’d better read it for yourself! 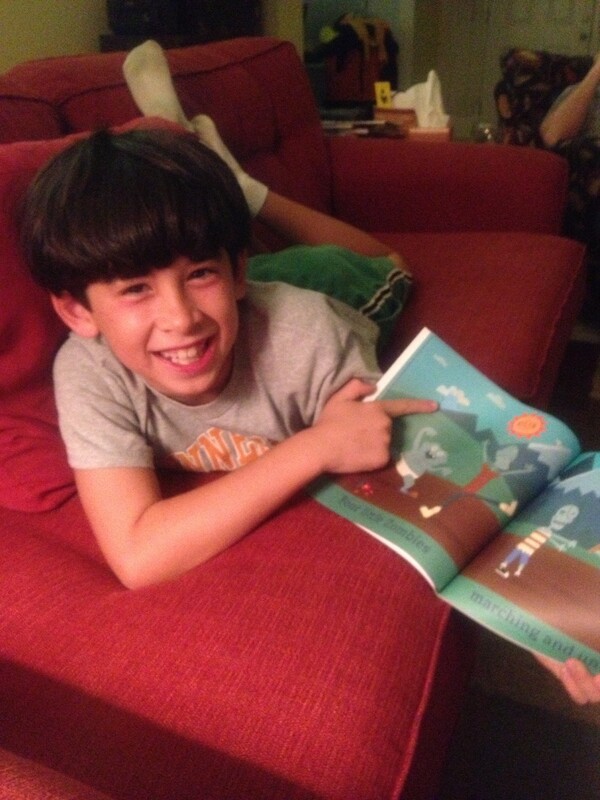 The book’s illustrations are whimsical and put smiles on my whole family’s face! It’s illustrated in the style of a young child’s book, but trust me, you probably won’t want read this to your two-year-old. If your kids are familiar with zombies and you have no problems with teaching your children what to do in case of a zombie apocalypse, by all means, this will make a GREAT gift! Let me tell you about what makes this book so special. You need to pay attention to the numerous hidden stories in the background. After reading about Fred’s adventures, go back to the beginning and check it out again…this time, look at the mini-stories. Between the cows, penguins, polar bears, people, and clouds, there are so many other fun things going on! Jules is a HUGE Star Trek fan, and she told me a little secret: It’s no accident that Fred is wearing a Red Shirt! Do you like how cute Fred is? In addition to the book, be sure to check out the Fred merchandise and digital music downloads that are available. The “theme song” is an awesome accompaniment to the book and you can listen to it and buy it (along with with the also-awesome “Ballad of Fred”) for just $2 through this link. Five Little Zombies (and Fred) is available as a paperback or for your eReader and will make a great gift this Halloween or Christmas for your friends who are actively preparing for the apocalypse. A complimentary copy of this book was provided for review purposes…. 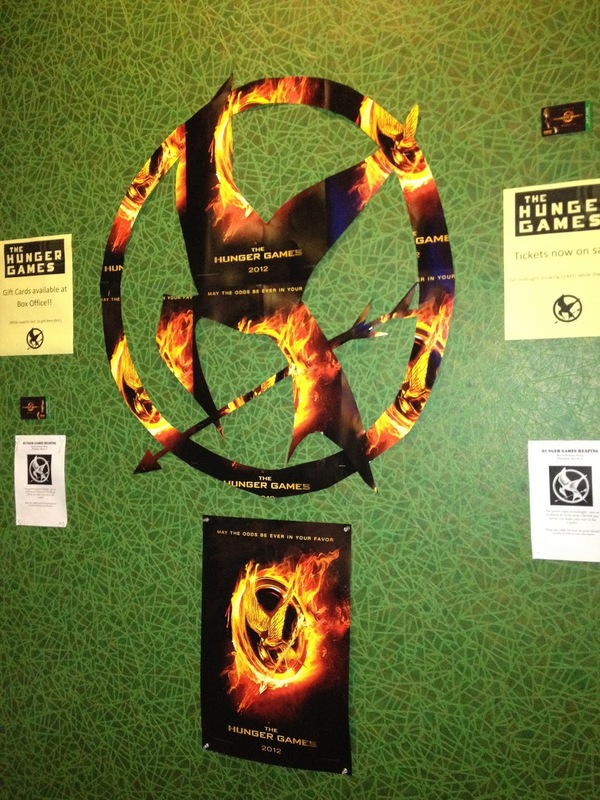 This was at the Rave theater near Cordova Mall in Pensacola. Someone had a good time making this out of posters. Today I did something very anti-social. I went BY MYSELF to a movie. I can’t remember the last time I did that. I just didn’t feel like coordinating with anyone else. I knew I could go on Friday while the kids were at school and I didn’t want anyone to stop me. I had been drooling to see The Hunger Games movie for about a year. Probably because I read the trilogy about a year ago. For the past 12 months, I discussed with the GeekMoms on our message board every time photos from the film shoot, posters and trailers were publicized. Canadian illustrator Andrew Kolb decided to illustrate a children’s book with the story told in David Bowie’s hit song “Space Oddity“. Now, you should know why this is interesting to me…. Mr. Kolb had put a link to the PDF of this book on his homepage earlier this week, but then he received a cease and desist request from the song’s copyright owner and he’s since had to remove it. According to the news article linked here, he’s working out the legality of this, and he’d like to illustrate more ballads of classic songs. Here is a You Tube video with the pages of the book set to the song that might or might not be available for very long. I noticed the lack of capitalization of the words “Major” and “God”, that the spaceship looks like the Death Star, and that the spaceship is ENORMOUS, but the illustrations are very cute and my sons would enjoy this very much. As many of you might remember from my days in Deidre’s Bookclub, I typically don’t read fast. I was lucky if I could get around to finishing the club’s book of the month! Not so here! I’m able to read 1-2 hours per day and I am absolutely blasting through so many books I’ve wanted to read for years and years! Enjoy this list. I’m maintaining this list on my iPhone’s notepad function and I can email it into my blog as it grows. Today I start a new book, Predator by Patricia Cornwell.